Modern shoulder straps were originally prescribed by a War Department Circular of January 21, 1937. They are worn on the Army Blue Uniform. 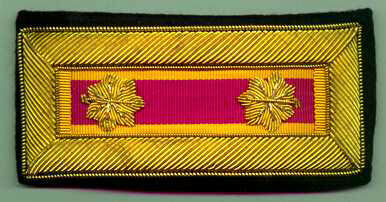 Characteristic features include three-eighths inch borders, which are manufactured of machine embroidered yellow thread or of all dead bullion, and fields made of grosgrain, a ribbed material similar to that used on the ribbons of medals. There are many more branch colors than existed during the 19th Century. The execution of the embroidery work is not to the same quality as found on 19th Century straps. Modern colonel's eagles are made to the same size as pin-on insignia and lack the artistic qualities of 19th Century bullion embroidery work. The eagle faces forward and the olive branch. The major's leaves are very different from those used in the 19th Century and also resemble pin-on grade insignia. Branches with two colors display one as an inner border (yellow) and the other as the central field color (crimson). This practice began in 1902 with the Corps of Engineers. 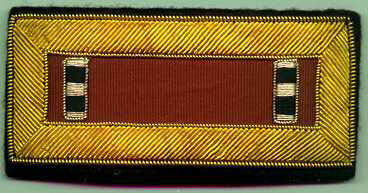 This is an example of a machine embroidered shoulder strap, which may be worn in place of bullion embroidered ones. The captain bars are jointed at the top and bottom. This is another vestige of pin-on insignia. Shoulder straps were approved for Warrant Officers after the Second World War. All W.O. straps have a brown field. The grade insignia for Warrant Officers have undergone an impressive series of changes during the last 50 years.